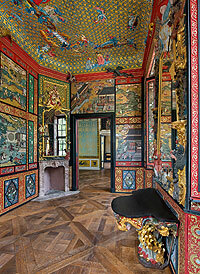 In 1715 Margrave Georg Wilhelm built the Old Palace near the residential town of Bayreuth as the central feature of a court hermitage. In 1735, when Margrave Friedrich took over the government of the margraviate, he presented the Hermitage to his wife Wilhelmine. 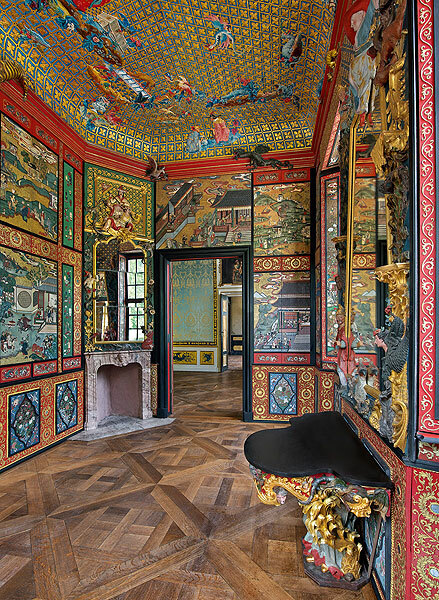 Fascinated by this unique complex, the margravine immediately began enlarging it, first adding new rooms to the Old Palace including a Music Room, a Japanese Cabinet and the Chinese Mirror Cabinet, in which she wrote her celebrated memoirs. Between 1743 and 1745 various buildings and fountains such as the Ruined Theatre and the Lower Grotto with the hermitage of Margrave Friedrich were produced from designs by Joseph St Pierre. The New Palace and the Upper Grotto were built from 1749 to 1753. 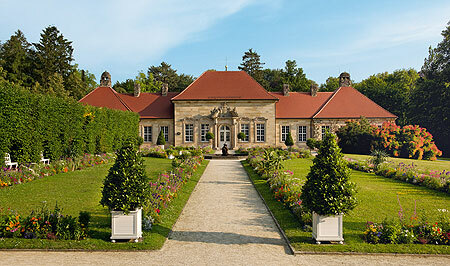 In the sections added by Wilhelmine to the existing gardens she introduced traditional baroque elements such as hedge gardens, pergolas and waterworks. Created in an era when there were no gardens of this type at all in Germany, the Hermitage is thus unique amongst the gardens of the 18th century. The Temple of the Sun is suitable for small concerts and exhibitions, lectures, and civil weddings up to 30 persons. The west wing is suitable for small concerts and exhibitions, lectures and receptions up to 80 persons. To visit the Old Palace is possible via the rear entrance and a ramp (for help please ring the bell marked "Kasse"). Wheelchairs can be hired on request. Most of the park is accessible for wheelchair users, with the exception of certain areas with steep paths. Bus to "Eremitage" or to "Ochsenhut"